Recurring Deposit (RD) is a special type of deposit scheme offered by Post Office and Banks, where a fixed amount is deposited every month for a fixed period and deposit amount along with compounded interest can be obtained at the time of maturity. Generally interest is compounded in quarterly basis. This article is intended to help you to understand everything you need to know about recurring deposits. 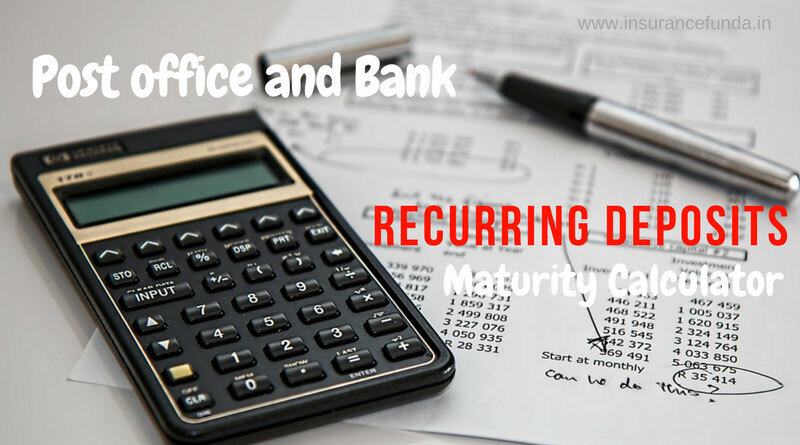 Maturity value and calculation of recurring deposit (RD) is really complex as the interest rate is generally compounded on quarterly basis. RD – Maturity value and Interest calculator provides an easy online solution by helping you to calculate the Maturity value and Interest rates of RD deposits for any duration amount and interest rate. Even though RD schemes generally compound on quarterly basis, yearly, half yearly and monthly compounding can also be done on this calculator. If you are unable to view RD Calculator here – Click to open RD Calculator. Recurring Deposit (RD) schemes – from where you can get it. Almost all banks in India and India Post (under Post office savings scheme) offers Recurring Deposit schemes in one form or another. Interest rates and conditions of schemes varies widely from company to company. Up to 50 % of available amount can be withdrawn any time after first year. Amount withdrawn should be repaid with interest before RD matures. Recurring Deposit – How is interest and maturity amount calculated? Let us have a look at the compound interest calculation first. Recurring deposit or RD is paid monthly but it is compounded quarterly. So in order to find the total maturity value in RD, we should calculate the final value for each installment separately and then add them all to get the final result. Alternatively you can use a special formula to calculate the RD maturity value in a single step. Where, M = Maturity value,R = Monthly Installment, r = Rate of Interest (i) / 400 and n = Number of Quarters. Although this formula seems to be complex you can easily calculate the maturity value of your recurring deposit for any tenure and interest rates using the Online – RD Calculator provided at the top of this page. Recurring Deposit -RD – Income tax rules applicable. Tax Deducted at Source ( TDS ) is applicable on the interest earned on RDs . If interest earned on recurring deposits exceeds Rs. 10,000 a year, TDS at the rate of 10 per cent would be deducted by the bank. Also, the Tax Deducted at Source (TDS) will be 20% if the Pan information is not provided. Income tax is to be paid on interest earned from a Recurring Deposit at the rate of tax slab of the RD holder. Investors with no taxable income will have to submit Form 15G to avoid TDS on both recurring deposits and fixed deposits. High Security: Investing RD involves 0 % risk and hence is very secure. Create investment Corpus: RDs can help you to create fund from small savings. Good Interest rates : Interest rates offered by RDs are comparable with fixed deposits rates.